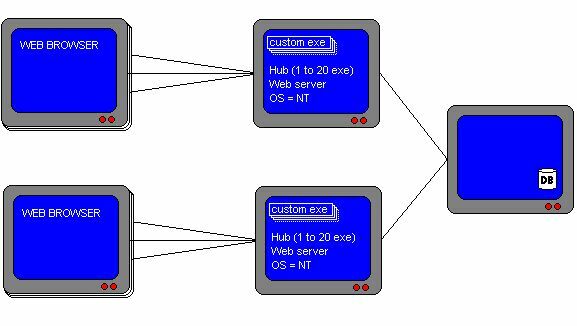 Multiple surfers, using web browsers, connect to a machine running NT, a web server, a WebHub runner, The Hub, and multiple instances of the application server (EXE). There can be one or more such web server machines. The database is kept on a separate machine. The database is isolated on a separate server. The database processing has the resources of a dedicated machine, and the CPU on the WebHub machine is able to work on surfer B in a second EXE while surfer A is waiting for the database answer to return to the first EXE. In this situation, even a single-processor WebHub machine will be able to serve many surfers in parallel. There are additional web server/WebHub machines in what's known as a "server farm" or "cluster." More physical machines allow you to serve even more surfers, up to the limits of your database server. Typically there is one "main web address" that surfers come in to, and they are then routed either by hardware or software to one of the machines in the cluster.